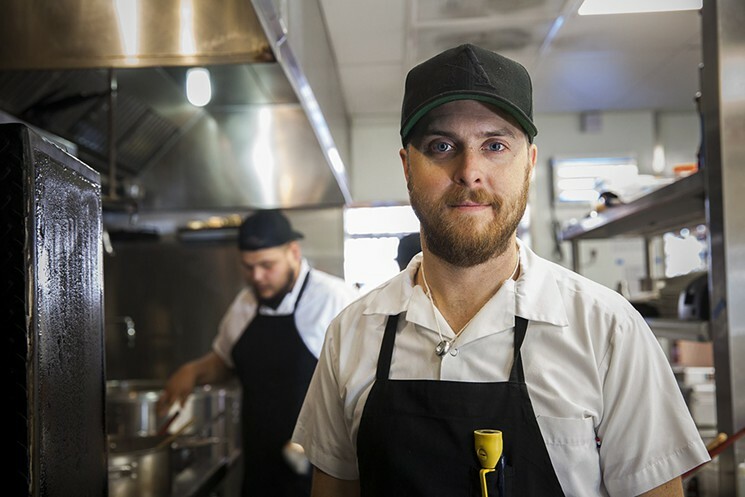 Adam Cole, 36, a career chef in Los Angeles with over two decades in the culinary industry, can barely taste: he has no sense of smell. His condition is called anosmia and it is congenital; he has never known odors. Though an estimated sixteen million Americans are affected by it, anosmia is undoubtedly the least known or understood of sensory disorders. Some are like Cole and have zero olfactory ability while others possess merely a weakened sense or interpret odors differently. Only 1% or so of anosmic people were born with it. The majority lost smell from disease, viral infections or head trauma. Often the disorder goes undiagnosed. It is largely incurable. “Even though smell and taste loss effect millions, probably more than are impacted by blindness or deafness, it’s still remarkably poorly understood by people and science,” says Steven Munger, a genetic biologist and director of the Center for Smell and Taste at the University of Florida. One of only a handful of clinics in the world focused on smell disorders, the Center also explores potential cures and treatments. “What we’re trying to do is create a more integrated system to help a large number of patients who are basically neglected in normal medical practice but also spur a greater amount of research around smell disorders,” says Munger. Part of that means getting the word out that anosmia exists in the first place. Towards that end, the Center, in conjunction with the British nonprofit Fifth Sense, organized an anosmia conference last year in Gainesville, SmellTaste2017, the country’s first such gathering. Over a weekend in February, sixty-seven participants joined with scientists, physicians, and patient advocates to discuss anosmia and show solidarity (anosmic people often go their whole lives without meeting another sufferer). There was even a “multisensory” banquet, featuring texture-heavy meals like cake frozen with liquid nitrogen and pop-rocks. Cole, who had only recently come out as anosmic, was invited by the Center to speak at the conference. He had never met anyone else with his condition. “It really knocked me off my feet,” he says. “I had no idea that there was this whole other group of people.” At the time, he was a co-owner and chef at Maple Block Meat Co., a barbecue restaurant in Culver City, California. He has since joined a speciality food manufacturing company, AG Standard, while traching at the New School of Cooking. Folks reached out to Adam to hear more about his experience growing up with anosmia, how the disorder impacts his culinary style, and the primal joy afforded by a delicious ramen bowl. First off, how did you get into cooking? I’ve always enjoyed cooking. As a little kid, I would make my own sandwiches, and pack my own lunches for school. My first job was with my mom running a little ice cream shop for a summer when I was 14. My first real job was as a dishwasher at the local steakhouse when I was 15. When I was 17, I took my first cooking job in this little pizza restaurant in my hometown. Why don’t you need to smell to be able to cook? Cooking has never been easy for me. I don’t suspect it ever will be. What it comes down to are dedication and discipline. Technique is everything. I’m kind of a nerd, an eternal student. I love to read about food, to understand food and how it works. I like to try and understand the science behind food. For me, it’s constant education and that’s why it never gets old. That’s what I love about it. I love the challenge of cooking. For most people, they’re on autopilot to some extent, especially when it comes to high-end cooking. I’ve gotten to where I am because I’m stubborn and will never quit. I’ll do something over and over again until I’ve got it right, until somebody who knows what right is tells me it’s right. Then I’ve got [a recipe or technique] in my repertoire. For twenty years I’ve been building that repertoire of techniques. I’ve always had a confidence issue with cooking. Partly because there’s just an awful lot of times early in my career where I just had no way of knowing if what I was doing was right or not. I’ve needed a lot of guidance in my career. I’ve been lucky to have a lot of incredible mentors. What kind of techniques do you employ to compensate for your anosmia? When baking bread, most can smell when that loaf is done and take it out of the oven. If you have milk on the stove you can smell it when it’s about to scald. I can’t. I can’t smell anything that’s burning around me. So I have always had to have a really heightened sense of awareness of what’s going on. I set an awful lot of timers. I utilize the kitchen timer to its fullest extent. It’s integral to me. It’s compensation for not being able to rely on intuition. When did you realize that you couldn’t smell? I always sort of wondered about it. To others, I played along, “Oh yeah, I can smell that,” but I never really quite understood what everybody was talking about. There was a time when I was really young on the school bus and these older kids in the back made a fart joke. They’re saying, “Oh, that stinks!” and I start playing along. It was a funny moment because I was just trying to be cool like the older kids and play along with them. That’s the first time I really remember thinking, I really don’t smell anything; every time I do this I’m pretending. You can’t smell, but how much can you taste? My trigeminal nerve is intact. So alcohol tastes hot, mint tastes cool, something like menthol I can feel in my nose. I can only taste the basic flavors: sweet, sour, salty, bitter, kind of umami. Beyond that I don’t really have any flavor perception. When did you first know that this was something that others even had? I can only taste the basic flavors: sweet, sour, salty, bitter, kind of umami. Beyond that I don’t really have any flavor perception. I took it to heart and didn’t tell anybody from then on. Only my close family and girlfriend knew for a lot of years. I worked with Michael Voltaggio for about ten years. I had already been working with him for five as a sous chef before he found out. I had to break the ice. What made you spill the beans? I was in a position where I didn’t have a choice. We were serving sous vide beef short ribs and we had this whole batch of beef short ribs and half of them were fine and half weren’t because the vacuum-sealing machine wasn’t working properly. These short ribs are very expensive so we couldn’t just throw away the whole batch. The only way to know was to heat them up, open the bag and smell them. I had to either tell this chef who I’ve been working with for a very long time my decade-long secret or risk getting a customer sick. As we’re cooking I turn to him and say, “You have to help me smell these. I can’t smell.” He turned and said, “You can’t smell?” Then we just went on and worked the rest of the service. It never really came up again. Lucky for me I had already gained his trust. It ended up not being an issue. At that point I was like, “Who cares now?” I didn’t try to keep it a secret anymore. I had to either tell this chef who I’ve been working with for a very long time my decade-long secret or risk getting a customer sick. What are some cooking tips for anosmic folks? Roasted chicken is a very basic thing, the quintessential home meal. But if you can’t smell or taste very well, it’s very difficult to gauge how much you should season it. So I recommend brining it. I have a brine recipe for brining the chicken the day before you roast it so you don’t have to season it at all. The brine does all the seasoning so you know it’s well-seasoned every time. When cooking for anosmic people, texture is a huge thing. And temperature. Contrasting temperatures and textures is where the pleasure comes from. Numbing too. It is a sensation that I relate very closely to smoked foods. Because I can’t really taste the smoke or perceive the flavor of the smoke, what I get from that sensation is a little bit of numbing on the end of my tongue. What are your some of your own favorite meals? Ramen. I go down to Little Tokyo and eat ramen. Noodle soup. Love it. The texture of the broth, the alkaline chewy noodles. Something near and dear to my heart. When I’m cooking at home, it’s not the fancy food I love. It’s food that speaks to my heart and childhood. Things that are nostalgic. My wife makes her mom’s chicken and twist noodles with cream and mushroom soup out of a can. It’s delicious. I love it every time. My favorite restaurant in LA is called Home State. All they make is central Texas-style breakfast tacos. So simple and so good. Keep all that fancy food. I want simple comfort food.